Encourage your little baker’s love of cookies and cakes with this vintage-style baking set that’s meant for make-believe AND real life baking. 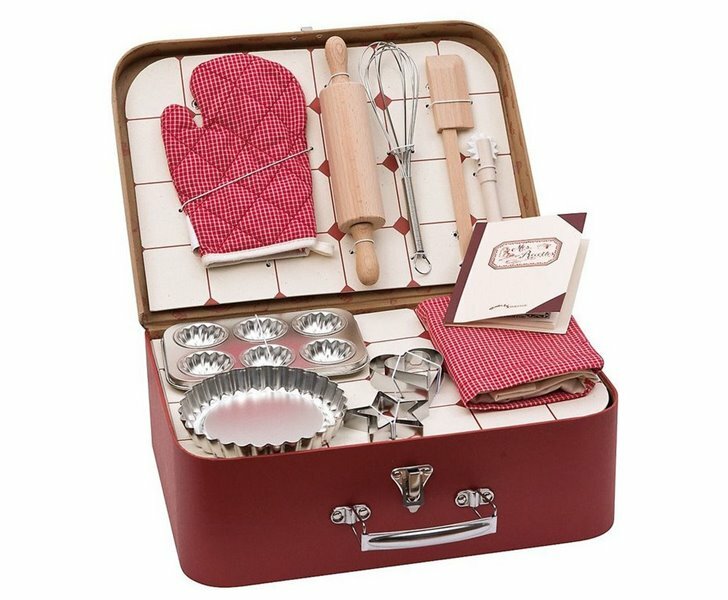 The Moulin Roty Baking Set is sized for children, with tools that little hands can use to make baked goods. The set includes: a wooden rolling pin, pastry cutter and scraper, wire whisk, and 2 star and 2 heart shaped cookie cutters. Best of all, the sweet tartlet pan and mini muffin pan can both whip up a batch of treats in a play kitchen oven OR your real oven. Also included in the set are a brightly colored apron and oven mitt and recipe book (in French). The entire kit comes in a recyclable, but sturdy valise that latches shut, making this ideal to tote along to grandma’s house or a play date. Safe for children ages 6 years and up. Encourage your little baker's love of cookies and cakes with this vintage-style baking set that's meant for make-believe AND real life baking. 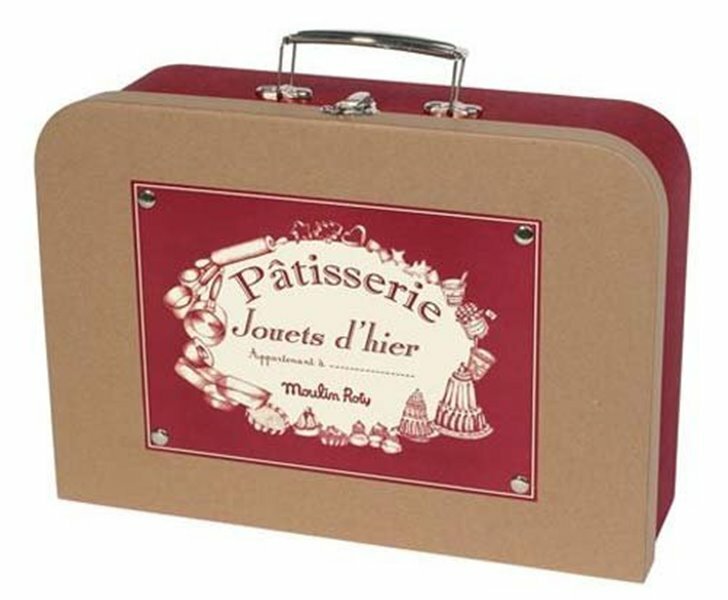 The Moulin Roty Baking Set is sized for children, with tools that little hands can use to make baked goods. The set includes: a wooden rolling pin, pastry cutter and scraper, wire whisk, and 2 star and 2 heart shaped cookie cutters. Best of all, the sweet tartlet pan and mini muffin pan can both whip up a batch of treats in a play kitchen oven OR your real oven. Also included in the set are a brightly colored apron and oven mitt and recipe book (in French). The entire kit comes in a recyclable, but sturdy valise that latches shut, making this ideal to tote along to grandma's house or a play date. Safe for children ages 6 years and up.